SAUSALITO, CA--(Marketwired - Jul 22, 2014) - Today, Vice President Joe Biden released a new report called Ready to Work: Job Driven Training and American Opportunity and recognizes Glassdoor and its newest job search tool Job Explorer. Launched earlier today, Job Explorer is designed to help job seekers map out their next job move and advance their careers. In the Ready to Work report, Biden recommends mobilizing America's innovating companies to help create "upskilling" opportunities for American workers and employers. As such, he calls out Glassdoor as an example of a technology company that is committed to building new free tools to help job seekers better understand their options so they can make smarter investments of their time and resources. "We've been delighted to cooperate with the White House to develop new tools to help connect job seekers with open jobs, and in making sure people have the information they need to make smart career choices," said Robert Hohman, co-founder and CEO of Glassdoor. "We're honored to be recognized by Vice President Biden and are proud to provide our technology platform to help people find jobs that can help lower the unemployment rate and boost our nation's economy." Job Explorer is the output of a challenge presented to Glassdoor's data and engineering teams to create a tool that could help people find jobs. The beta product was presented to Vice President Biden, Labor Secretary Perez and other key officials during a private brainstorming event at the White House last month. Days later while speaking at the National Governor's Conference, the Vice President went on to highlight Glassdoor as an "entrepreneurial company that has expanded on the traditional model of job posting websites." The release of Biden's report coincided with President Obama signing the Workforce Innovation and Opportunity Act (WIOA), in which Glassdoor CEO and co-founder Robert Hohman and general counsel Allyson Willoughby were in attendance. More information about Glassdoor Job Explorer can be found in our press release, blog, and in a brief video: http://bit.ly/1zYGeae. Glassdoor is the world's most transparent career community that is changing the way people find jobs and companies recruit top talent. Founded in 2007, Glassdoor offers members the latest job listings, as well as access to proprietary employee-generated content including company-specific ratings and reviews, salary reports, CEO approval ratings, interview questions and reviews, office photos and more. Members also have the ability to see Inside Connections™ at particular companies via their Facebook network. In addition, thousands of employers are using Glassdoor for Employers to support their recruiting and employment branding efforts. Glassdoor, which won the 2013 Webby Award for Best Employment Site, is one of the most popular mobile job apps on iOS and Android platforms. Glassdoor is backed by Benchmark, Sutter Hill Ventures, Battery Ventures, DAG Ventures, Dragoneer Investment Group and Tiger Global. More information about Glassdoor can be found on the Glassdoor Blog, Glassdoor for Employers Blog and by following the company on Twitter, Facebook, Google+ and LinkedIn. 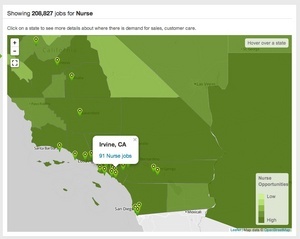 Job Map & Opportunity Scale - See job openings by city and state. The darker the highlighted region on the map, the greater the opportunity is to find work, which is determined by number of job listings, unemployment rate, and population.